In the last few decades, numerous experiments have shown that humans do not always behave so as to maximize their material payoff. Cooperative behavior when non-cooperation is a dominant strategy (with respect to the material payoffs) is particularly puzzling. 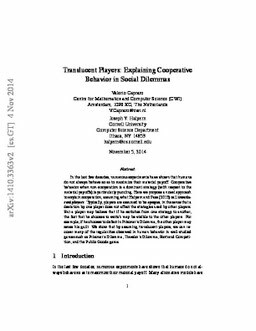 Here we propose a novel approach to explain cooperation, assuming what Halpern and Pass (2013) call translucent players. Typically, players are assumed to be opaque, in the sense that a deviation by one player does not affect the strategies used by other players. But a player may believe that if he switches from one strategy to another, the fact that he chooses to switch may be visible to the other players. For example, if he chooses to defect in Prisoner's Dilemma, the other player may sense his guilt. We show that by assuming translucent players, we can recover many of the regularities observed in human behavior in well-studied games such as Prisoner’s Dilemma, Traveler’s Dilemma, Bertrand Competition, and the Public Goods game.